﻿ Best Price on Monteverde Lodge & Gardens in Monteverde + Reviews! Located in Monteverde, Costa Rica. This lodge is located 15 minutes’ drive from the Monteverde Biological Reserve and 0.6 mi from Monteverde Town Center. It features an extensive garden with a heated outdoor pool. Guests can also enjoy the indoor butterfly garden. WiFi is included at no extra cost. 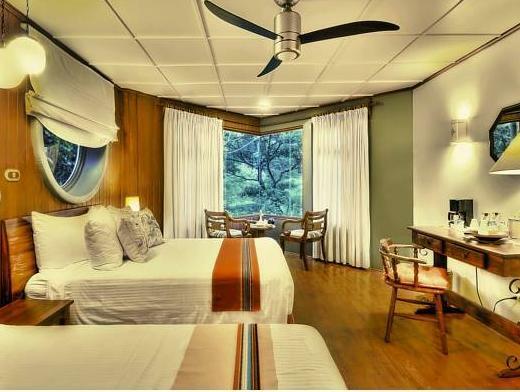 Rooms offer views of the forest and gardens. 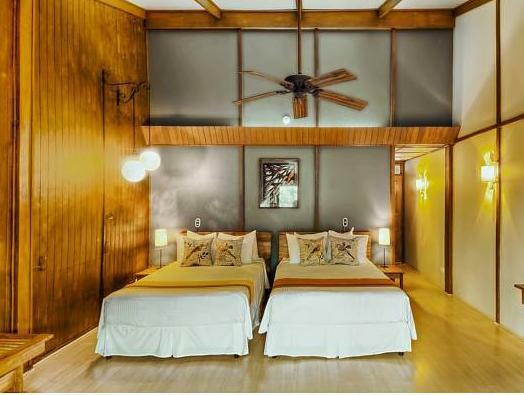 Both upstairs and downstairs rooms have solar-heated hot water showers, an in-room safe, coffee maker, alarm clock, ceiling fan, reading lamps, hair dryer and laundry bag. The lodge's El Jardin Bar & Restaurant offers a bar setting around an open fireplace. The menu offers traditional Costa Rican and international recipes made with local ingredients. Guests can also find a variety of dining options within 492 feet. The Monteverde Lodge & Gardens can arrange activities such as tours and hiking, horse riding and bird watching. The property also has experienced on-site guides that can organize day and nighttime excursions into the wilderness. The property is 3.7 mi from the Santa Elena Reserve and 3.1 mi from the Monteverde Cloud Forest Reserve. Juan Santamaría International Airport and Liberia International Airport are both a 3-4 hour drive away. The lodge can arrange transfers with advance notice. -Children: All Children are welcome, it’s important to inform the property how many children are traveling with you before you arrive at the lodge, so you can be assigned the proper room. -Maximum Occupancy: A maximum of 4 guests are allowed per room. Parties of 5 or more guests (adults or children) must book a second room as it is not possible to accommodate more than 4 guests in one. -Extra Bed: Rooms accommodate a maximum of 4 people total including adults and children. One additional bed can be added to some rooms. This additional bed is added so children do not have to share a double bed. Including the additional bed, rooms are for a maximum of 4 people. -Additional Fees: The room rate is for two people. Up to two additional guests (including children over 10) can stay in the same room for an additional charge. Additional guests pay $40 or $45 (depending on the season) per person per night. Additional fees are not calculated automatically in the total cost and will have to be paid separately during your stay. Guests are required to show a photo ID and credit card upon check-in. Please note that all Special Requests are subject to availability and additional charges may apply.